PDA’s Annual Meeting is one of the “can’t miss” events for 2018, offering a multifaceted look into the future of pharmaceutical manufacturing! At this year's meeting, speakers will focus their presentations on the end-user’s/patient perspective, innovative manufacturing strategies, disruptive technologies, and product value chain logistics. The increased use of Big Data, Artificial Intelligence, and robotics in the industry will also be explored. In response to attendee feedback, PDA is debuting a NEW meeting format at the 2018 PDA Annual Meeting. This format is designed to better meet the needs of our attendees. The Grand Opening Celebration will kick off in the Exhibit Hall at 5:00 p.m. on Monday – take advantage of your first opportunity to see the latest products and services and meet with exhibitors! Interest Group sessions will be held at the same time as the breakout sessions, giving attendees more sessions from which to choose during the day and allowing for more free time in the eveningThe Gala will be the final event of the Conference, taking place on Wednesday at 7:00 p.m. – Be sure to stay and celebrate with us! 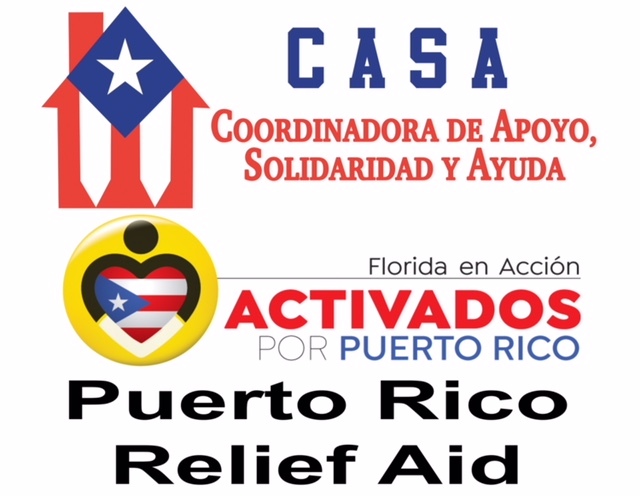 In the wake of the back-to-back hurricanes that devastated Puerto Rico and its pharmaceutical manufacturing plants in 2017, PDA will make a charitable donation to CASA, a 501 (c)(3) non-profit organization based in Orlando, Florida, that has been actively helping the hurricane survivors, sending more than 2.5 million pounds of supplies to the people of Puerto Rico. CASA is also actively assisting evacuees who have relocated to Florida by offering English classes and other trainings to help improve their opportunities for employment. Donations can be taken onsite at the 2018 PDA Annual Meeting or by contacting the PDA Registration Department at +1 (301) 656-5900 ext. 115 or registration@pda.org. PDA’s flagship Annual Meeting provides a venue for obtaining the latest and most comprehensive information on a broad range of topics related to processing, manufacturing and quality control. More importantly, the Annual Meeting is the ideal forum for sharing best practices and learnings on how the industry applies novel approaches for the development and commercialization of pharmaceutical and biopharmaceutical products. The trend continues with the 2018 PDA Annual Meeting. The theme of the 2018 meeting is Agile Manufacturing Strategies: Driving Change to Meet Evolving Needs. In selecting this theme, the planning committee’s goal is to design a comprehensive event that encompasses the wide-ranging interests of all PDA members. We will cover relevant information important to both small molecule pharmaceutical and biopharmaceutical industries. Plenary sessions focus on patient perspective and future visions, genomic profiling and even a new topic – Disruptive Technologies. Additional plenary sessions further explore current and future trends in process development and manufacturing including next generation processing and facilities, the application of big data for process design and optimization, and accelerating the industry response to healthcare needs. Concurrent session tracks were selected to support the conference theme and offer participants a closer look at continuous processing, patient centricity, disruptive technologies and complexities in the product value chain. Rounding out the program are Interest Group sessions, which offer participants a chance to engage in interactive discussions on a variety of important topics and specific disciplines. The exhibition hall provides opportunities for one-on-one interactions with service providers and vendors who will showcase the latest services and technologies. Authors of numerous poster presentations will also be present to discuss their latest research and data. Social events and breaks are scheduled throughout the meeting to allow time for further networking and peer-to-peer discussions. This meeting is a ‘must attend’ knowledge sharing event for everyone and especially for those who have recently joined the industry, it is an ideal opportunity to accelerate your impact and position in your company as well as in the pharmaceutical society. Don’t waste time to organize your attendance at the 2018 PDA Annual Meeting. Please see agenda for the most updated list of speakers and sessions. Ghada Haddad, MBA, Executive Director, Global cGMP & Compliance Auditing Organization, Merck & Co., Inc. Session Description: All delegates at this conference are in some way involved in the path of providing pharmaceuticals to patients. It is a privilege and offers a clear purpose to be part of a community that have the possibility to make an instrumental difference to the individual patient as well as to the society in general. This option to make a difference, comes with substantial responsibility to ensure that we do our outmost to meet the expectations of the patients and health care professionals, who rely on us in providing safe and effective pharmaceuticals. During a busy workday with numerous daily challenges, the outcome of our work might be a bit out of focus, and maybe not the first thing we think about when we start working in the morning. This session offers to give a clear perspective of the individuals that ultimately are benefiting from our daily efforts. Moderator: Tia Bush, Vice President, Quality, Amgen, Inc. Session Description: Today’s healthcare is not sustainable due to the rising costs of treatment, ageing populations, and healthcare worker shortages. The future of medicine will be innovative, patient focused, and digital. Our industry and the regulatory framework that governs our products and services must overcome technical and cultural challenges by embracing disruptive technologies that make healthcare more effective, by putting patients in the center of healthcare strategies, by digitizing information to grow our understanding of disease and treatment, and shifting the healthcare from a “break and fix” mentality to one of prevention. This session will explore the trends in technology and how they will alter our current view of the healthcare system and the medicines we make to improve the lives of patients. We will also explore how companies must build their culture of innovation in order to deliver on this promise. Session Description: Our understanding of genomics is dramatically changing healthcare, leading the way to personalized care. Advances in the field of DNA sequencing and the ability to collect and analyze large amounts of data quickly has played a critical role in the evaluation of research. Using genomic profiling it is possible to map an individual’s unique genomic profile, providing physicians with invaluable information to help determine the best treatment. It can be used to find out why certain people get diseases while others do not, or why people react differently to the same drug. Likewise, this data can help biotech companies make informed decisions in their R&D investments. This session will explore the role of genomic profiling as a tool for identifying the potential risk of certain health conditions and application of treatment strategies/therapies that are tailored to the genetic profile of each patient. 9:45 a.m. - 6:30 p.m.
Pediatric Formulation Development of Epinephrine Injection: A Child’s Play? Ajay Babu Pazhayattil, Associate Director, Apotex, Inc.
Moderator: Aaron R. Goerke, PhD,Director/Head of MSAT, Singapore Technical Operations, F. Hoffmann-La Roche Ltd. Session Description: The IT revolution is evident all around us, but the emphasis has mostly been on the T, the technology. It is time to recast our gaze to focus on the I, the information. Perhaps this information really means insight. Has your company made this transition and began treating data as an asset and not a cost? Are you getting insight out of information? Responses vary across Pharma manufacturing as do their ability to harness information in novel ways to produce insights of significant value. This session will explore examples of where data is being put to new uses to solve difficult real-world problems. Different strategies, learning's and challenges encountered, some of which might not have been overcome, will be key takeaways. There is a revolution underway in IT, but it is just as much in the information side of the acronym as in technology. Michele D’Alessandro, Vice President and Chief Information Officer, Manufacturing IT, Merck & Co., Inc.
Thomas Seewoester, PhD, Executive Director and Plant Manager, Amgen Inc. Session Description: The face of pharmaceutical manufacturing has changed drastically in the past two decades. Not only from a technological and science standpoint, but also with regards to the regulatory and political environment. Shorter patent protection, lower price premiums and increasing barriers to reimbursability have created a market where faster development, smaller volumes and increasing levels of customization are not only more common, but also more desirable. Deciding when to invest in house and when to leverage a third party has become a critical business decision, as limited resources must be carefully divided amongst a wider range of needs. Third party companies are being actively leveraged cross all stages of the product lifecycle, from development to launch and through product end of life; from the labs to manufacturing. This session will explore a few of those scenarios, sharing experiences and points to consider when making these critical decisions. Session Description: This session will have short presentations on current issues in process validation (PV), followed with open discussion afterwards. A small panel of SMEs will be assembled to lead the open discussions. Session Description: Annex I includes a controversial paragraph on the integrity test pre-use/post sterilization. This paragraph causes severe problems within the industry. Since the Annex I revision will be published, we require to review the paragraph posted in the revised Annex I and see what activities require to be taken. Session Description: Continuous manufacturing offers compelling benefits with respect to costs, process flexibility and capacity. In fact, the 21st Century Cures Act, enacted in December 2016, authorized grants to support studying Continuous Manufacturing of drugs and biological products. Control strategies for these processes must also continuously provided assurance of quality, mitigating any risk to product quality because of process variations over time. This session will focus on science and risk based approaches to control strategies that can be implemented to monitor and ensure appropriate understanding of process dynamics and their relation to process conditions and raw material control. Tools including model-based control, multivariate monitoring, automation and real-time release testing will be discussed as well as identification and rejections of non-conforming segments. Session Description: The need for improved aseptic manufacturing capabilities has led to innovations in Isolator technology. To meet increasing product demand while ensuring patient safety and product quality requires new thinking in implementing aseptic processes and capabilities. To continue to be effective manufacturing it is necessary to look at systems that are reliable yet flexible. This session will showcase two different strategies for implementation of strategies to improve aseptic processing capabilities. Speakers will share innovative ways to implement robotics and environmental considerations with regards to isolator technology. Ross Gold, P. Eng., Vice President, Engineering and Co-founder, Vanrx Pharmasystems Inc. Session Description: Surviving a QRM Program Audit: With new and evolving manufacturing strategies, QRM programs are also evolving to meet new demands and in some cases becoming more mature. With this change in the environment, Regulatory Authorities are also changing and requiring more from the industry with respect to their QRM programs. In this session we will discuss strategies in presenting a QRM program to Health Authorities, with presenters who will provide actual examples and case studies. Participants will also be working in teams to develop audit strategies and responses to practice scenarios. Examples will be presented that address both what the auditor is expecting as well as how the auditee should plan on responding. This will include both proper and improper use of QRM in audit responses. The session will end with lively dialogue involving both the participants and the presenters, as we work through the scenarios as a group. Peter Makowenskyj, Sales Engineer, G-CON Manufacturing, Inc. Session Description: BioAB has recently changed the name and scope for the Biotechnology IG. We renamed the IG to Biopharmaceutical Manufacturing as this focus better aligns with PDA’s overall mission to advance pharmaceutical manufacturing science and technology. This session represents the inaugural meeting for the newly formatted Biopharmaceutical Manufacturing IG. Following this introductory discussion, the session will focus on the latest developments in manufacturing science and technology for biopharmaceutical products including advanced cell and gene therapies. The content will include both presentation and time for interactive dialogue addressing topics related to process optimization to streamline operations, improvements to increase efficiency and reduce costs, and approaches for achieving the highest level of biopharmaceutical product quality. Session Description: High production costs, patient affordability and accessibility, and maintaining an uninterrupted supply of product are primary concerns of the biopharmaceutical industry. To address these issues, the term agile bioprocessing might best describe the next evolution needed for biopharmaceutical manufacturing. Indeed, industry efforts are now being directed towards reducing the long development cycle times, increasing production flexibility and eliminating processing complexities all with an aim towards addressing current challenges. This session explores innovative approaches being considered for future biopharmaceutical manufacturing operations, with an emphasis on latest developments in continuous bioprocessing. Session Description: The healthcare industry is experiencing unparalleled change. Millions of data points are generated throughout the end-to-end supply chain that can be converted to knowledge and understanding that leads to meaningful and timely action to improve manufacturing processes and drive organizational efficiency. A comprehensive digital strategy and structured data analytics can explore techniques such as visualization, modeling, automation, machine learning, and artificial intelligence to dematerialize manufacturing processes and facilities and drive productivity through fewer errors, higher output, and improved quality, safety, and speed. This session will explore case studies where companies have advanced their digital strategy to deliver meaningful value and advancements to the business. Patrick Gammell, PhD, Director, Process Development, Amgen, Inc.
Greg Naugle, MS, Executive Director, Lead Drug Substance Technology and Engineering, Amgen, Inc.
Outline the objective and mission of the Cell and Gene Therapy Interest Group. Introduce and solicit volunteers for a new Technical Report, Process Validation for Cell Therapy. Provide a 30-minute presentation on risk assessment for aseptic processing for cell therapy. This presentation will be a case study and set of recommendations for the establishment of an effective aseptic processing verification program for these innovative products. Session Description: The Facilities and Engineering Interest Group can cover many specific technical interests within the industry as they relate to Manufacturing Facilities and Engineering capabilities. There has been a tremendous amount of discussion around Aging Facilities the past couple of years, so for this meeting, the focus will shift to look at innovation. During the B2 session, we heard about two different approaches to improving aseptic manufacturing capabilities. In this IG session, we will continue to talk with those speakers to take a bit of a deeper dive into their presentations to learn more about their specific examples. 7:30 a.m. - 1:45 p.m. Session Description: In the past capacity and capability increases meant lengthy, but especially cost intensive expansions of rigid production and process infrastructures. New technology platforms, like single-use processes create the ability to increase or utilize the current capacity in a more flexible, but also efficient way. The new process technologies furthermore enable new process models like continuous processing. The factors listed will change our current thinking of investments to be made, capacity flexing and capacity location, to name a few. Examples of such innovative production and processing platforms will be presented as well as the benefits of such. Arleen C. Paulino, Vice President, Singapore Site Operations, Amgen, Inc.
9:30 p.m. - 10:00 a.m.
9:45 a.m. - 1:45 p.m. Session Description: Innovation in manufacturing should be at the heart of our efforts to ensure the sustained supply of better, safer medicines to patients. Yet our industry is very slow in adopting the wealth of new manufacturing technologies available. This session will discuss strategies for successful implementation of innovative technologies in pharmaceutical manufacturing, focusing on challenges, success factors and key learnings. Presentations will cover both the technical as well as the cultural and leadership aspects of implementation. Michael Abernathy, Executive Director, Regulatory Affairs CMC, Amgen Inc. Session Description: With the recent approval(s) of (a) CAR-T therapies in the US, and the explosion in the research into these types of therapies, there are over 300 trials listed on ClinicalTrials.gov, and over 40 active. CAR-T is not the only Patient Centric therapy being developed, and with this increase in active clinical studies, there is increased attention on managing the supply chain for these types of products. During this session, we will hear how the shift to a more patient-focused supply chain has impacted manufacturing models, price, cost, and complexity. We will also explore some proven solutions to the challenges posed. Leader: John G. Shabushnig, PhD, Principal Consultant, Professional title, Insight Pharma Consulting, LLC and Richard (Rick) Watson, Director, Sterile & Validation, COE, Merck & Co., Inc. Session Description: This Interest Group session will focus on the inspection of injectable products, specifically those considered “difficult to inspect” such as lyophilized powders, suspensions and protein solutions, as well as those in amber glass or plastic containers. A review of the recently published PDA Technical Report on this subject will be included in the agenda. A brief presentation reviewing relevant recalls, warning letters and 483 observations will be given followed by a moderated discussion on inspection topics of interest to those in attendance. Past discussions have included current experience with USP <790> and <1790>, selection and training of inspectors who perform manual inspection, industry benchmarks for inspection practices and inspection results. This session will help attendees gain an appreciation for the challenges of successfully developing, manufacturing, and marketing a combination product within the pharmaceutical company environment. Moderator: Ghada Haddad, MBA, Executive Director, Global cGMP & Compliance Auditing Organization, Merck & Co., Inc. Session Description: Until now, most medical treatments have been designed for the “average patient.” Because of this “one-size-fits-all” approach, treatments can be very successful for some patients but not for others. Precision Medicine, on the other hand, is an innovative approach that considers individual differences in people’s genes, environments, and lifestyles. It gives medical professionals the resources they need to target the specific treatments of the illnesses we encounter, further develops our scientific and medical research, and keeps our families healthier. Advances in Precision Medicine have already led to powerful new discoveries and several new treatments that are tailored to specific characteristics, such as a person’s genetic makeup, or the genetic profile of an individual’s tumor. This is helping transform the way we can treat diseases such as cancer: Patients with breast, lung, and colorectal cancers, as well as melanomas and leukemias, for instance, routinely undergo molecular testing as part of patient care, enabling physicians to select treatments that improve chances of survival and reduce exposure to adverse effects. In the last few years, we have seen a rapid development of new methods using immunotherapies in treating different types of cancer. By combining immunotherapy with other types of treatment, an increase of the effectiveness may be accomplished. Newer types of immune treatments are now being developed, and they will affect how we treat cancer in the future. This session will explore more about the status of where pharma development is today as well as example of a successful research. Your full conference badge is required to access this reception. As an Executive Director, Regulatory Affairs, Mr. Abernathy leads Amgen’s Global RA CMC function and is accountable for a product portfolio of over 50 programs. The extent of Michael’s product oversight and responsibilities traverse early and late-stage clinical development and approved life-cycle programs. He also leads Amgen’s advocacy and external engagement activities that comprise a CMC focus, including, promoting company and industry initiatives, engaging with Health Authorities and contributing to industry organizations. Prior to his current post, Michael has held roles of increasing leadership at Amgen, including active contributions to several of Amgen’s commercialized therapeutics, as well as spearheading the company’s Analytics Optimization initiative. Michael has been an active contributor to innovation during his 20 years as a Regulatory Affairs professional, thirteen of which have been spent at Amgen. Prior to joining Amgen, he held a leadership role within Colorado based Atrix Laboratories/QLT, Inc.’s Regulatory Affairs group. Michael began his career in the biotechnology industry as a Regulatory Specialist at the blood plasma-based company, Alpha Therapeutics (Grifols S.A.). Michael received his Graduate Degree in Cellular and Molecular Biology and was Regulatory Affairs Certified (RAC) in April 2004. Dr. Pierre Boulas is Senior Director, Head of Pharmaceutical Development at Biogen in Cambridge, MA. He received a PhD in Analytical Chemistry from the University of Houston, Texas and a graduate degree from the Engineering School of Physics and Chemistry in Bordeaux, France. For the past 20 years, Dr. Boulas has been involved in all aspects of chemistry, manufacturing, and control (CMC) technical support of pharmaceutical development programs for a variety of drug delivery systems. He is a primary CMC author of multiple global regulatory filings including more recently the filing for Nusinersen, an Antisense Oligonucleotide treatment for Spinal Muscular Atrophy (SMA) (approved by the FDA in December 2016). His main interests are in fostering change and innovation in pharmaceutical operations. His current focus is in the implementation of Quality-by-Design principles, innovation in manufacturing process controls and incorporation of patient insights in drug development strategies. Dr. Boulas leads the Pharmaceutical Development group at Biogen with responsibility over the drug substance and drug product development activities. Dr. Boulas represents Biogen on the Board of Directors of the IQ Consortium, an international association of pharmaceutical and biotechnology companies aiming to advance innovation and quality in the development of pharmaceutical products through scientifically-driven best practices and standards. He is currently serving as the Chair of the Consortium. He also served on the Board of Directors of the Enabling Technologies Consortium and the Allotrope Foundation. The Enabling Technologies Consortium is comprised of pharmaceutical and biotechnology companies collaborating on issues related to pharmaceutical CMC with the goal of identifying, evaluating, developing, and improving scientific tools and techniques that support the efficient development and manufacturing of pharmaceuticals. The Allotrope Foundation is an international association of pharmaceutical and biotech companies dedicated to the building of a “Laboratory Framework” to improve efficiency in data acquisition, archiving, and management. A self-motivated, competent and highly versatile operations leader with 24 years of progressive pharmaceutical experience in all aspects of the supply chain. A hands-on leadership approach highly focused on accountability and performance. Solid management and people-skills focused on hiring and developing strong teams. This approach combined with excellent business acumen has provided the foundation for progressive roles within fast paced, highly challenging and diverse work environments both domestic and international. Strategic and operational business partner with experience in diverse, multi-cultural and global business environments including sterile, liquid, and solid-dose pharmaceutical manufacturing with both internal and external sourcing. Ability to manage successfully in a matrix environment and influence/lead diverse, multi-cultural operations. Real-time experience with implementing successful lean manufacturing principles and operational excellence. Strong formulation experience and solid understanding of the GMP’s and their application to daily operations. Strong situational, organizational, strategic and creative leadership capabilities. Sharmista Chatterjee is currently the Division Director in Division of Process Assessment II, within FDA’s Office of Process & Facilities (OPF). Sharmista has been with the FDA since 2006. During her tenure she has been actively involved in new drug’s Quality by Design efforts, FDA-EMA QbD pilot program and Continuous Manufacturing. She served as the CMC Lead for QbD (Quality by Design) in the Office of New Drug Quality Assessment (ONDQA) and as the technical lead for the FDA-EMA QbD pilot. She is an Agency Expert in CMC Modeling and Simulation. In addition to her current responsibilities, she is serving as one of OPF representatives in CDERs Emerging Technology Team. Prior to joining the agency in 2006, she spent around 10 years in industry. Her industry experience was primarily in process development and modeling in diverse areas that ranged from consumer goods to pharmaceuticals with companies such as United Technologies Corporation (UTC), Procter and Gamble (P&G), and Forest Laboratories (now Allergan). She received a bachelor’s degree in Chemical Engineering from Indian Institute of Technology and a PhD in Chemical Engineering with a co-major in Biomedical engineering from Iowa State University. Michele is currently Vice President and CIO for the Manufacturing Division with Merck. In this role, she provides strategic leadership, oversight and delivery of information technology and digital solutions for the Merck Manufacturing Division. This includes Small Molecule, Vaccines, Sterile, and Biologics lines of business, as well as the enabling functions of Supply Chain, External Manufacturing, Global Science, Technology, and Commercialization, and Global Quality. Previously she served as Merck’s IT Transformation Supply Chain Leader responsible for supply chain strategy and integration through information-based productivity, and platform leadership for all domain analytics across the supply chain and manufacturing landscape. Prior to that, she led the ERP Competency Center including Global Program Director for Merck’s SAP program. Michele holds a Bachelors’ double major degree in Math and Computer Science from Rutgers University and an M.B.A. in Information Sciences from Rutgers Graduate School of Management. Michele also serves on the Strategic Advisory Board for Enigma and the Big Data Advisory Board for Rutgers University. Suzanne Farid is Professor in Bioprocess Systems Engineering at the Advanced Centre for Biochemical Engineering at University College London (UCL). She is Co-Director of the EPSRC-funded Future Targeted Healthcare Manufacturing Hub in collaboration with industrial and academic consortia. She is also Director of the UCL-MedImmune Centre of Excellence. Previously she was Co-Director of the EPSRC Centre for Innovative Manufacturing in Emergent Macromolecular Therapies. She joined UCL’s faculty in 2001 and leads research on ‘Bioprocess Decisional Tools’ for evaluating the potential of biotech investment opportunities under uncertainty. More specifically, she has pioneered the design of novel algorithms at the process-business interface to facilitate cost-effective bioprocess design, capacity planning and R&D portfolio management. These tools have been applied to strategic decisions in the development and manufacture of biopharmaceuticals and cell therapies. She sits on the ISCT Business Models and COGs Sub Committee, UK BioIndustry Association Manufacturing Advisory Committee and is a Fellow of the IChemE. She obtained her Bachelor’s and Ph.D. degrees in Biochemical Engineering with UCL and Lonza Biologics. I am an Executive Director of Process Development at Amgen, in this role I am responsible for running a Materials Attributes and Technology group within the Attribute Sciences function. In this role I lead Process Development activities including materials strategy, commercial investigation support and I also lead a team that drives data strategy and leverages integrated data analytics to enhance product data monitoring. I received my BSc and PhD in Biotechnology from Dublin City University in Ireland. Since 2013, the microbiologist Guenther Gapp has been working as an independent consultant for different clients around the globe and has been engaged in approximately 50 projects e.g. in assignments for remediation of companies cited with a Warning letter. In the previous steps of his career, he served in the pharmaceutical industry during 20 years as Head of QA/QC Microbiology department and Sterility Assurance Expert and Troubleshooter in global projects and supplier audits. During this period, he gained in-depth experience in Aseptic processing key elements and Risk Assessments, Training and motivation of operators, media fill practices of finished dosage forms and bulk products, environ- mental monitoring, rapid testing methods and regulatory agency audits. Guenther has been a subject matter expert in more than 20 FDA audits. He also created a new sterile risk assessment tool to identify and reduce the microbial contamination and compliance risk of aseptically prepared, sterile products. The publication of this Risk Assessment tool won him the 2011 PDA Journal of Pharmaceutical Science and Technology Award. He has been a speaker at several PDA conferences in the past years. Since 2017 he has been member of PDA´s EU Annex 1 Revision Commenting Task Force, Science Advisory Board and Co-Chair in the Isolator Taskforce. Jeffrey T. Gelwicks, Ph.D. is the Senior Director, Global Quality Laboratories for Eli Lilly & Company. He has responsibility for supporting the QC laboratories at Lilly, including product commercialization, global laboratory informatics systems, analytical stewardship for Lilly products, anti-counterfeiting initiatives and investigations, and providing specialized analytical technologies. A native of Maryland, Dr. Gelwicks received his B.S. in chemistry from Towson State University in 1984 and his Ph.D. in 1989 in biochemistry from Indiana University. He joined Merck & Co., Inc. in Rahway, NJ in 1989 as a Senior Research Analyst responsible for method development, validation, and troubleshooting for the QC organization. In 1992, he became the Quality Control Manager for the API manufacturing facility in Albany, Georgia and in 1993 was promoted to Director, Quality Operations for the manufacturing facility in Elkton, Virginia. In 2002, Dr. Gelwicks joined Eli Lilly as Director, Global Quality Assurance Auditing, responsible for GMP auditing activities globally, and in May 2004, he was appointed to the position of Director, Quality for Tippecanoe Laboratories. In January 2008, Dr. Gelwicks became Senior Director for global quality in Elanco, Lilly’s animal health unit. His responsibilities included global quality management for research and development, in-house and contract manufacturing, product distribution, and global affiliates. In August 2013, Dr. Gelwicks assumed his current role. Ross Gold is a pharmaceutical process engineer with experience in the design, development and fabrication of novel pharmaceutical manufacturing equipment, including automation systems. At Vanrx he leads the Technology group, guiding development and engineering of advanced aseptic process systems. He also works extensively with sites deploying and running Vanrx technology. Prior to Vanrx, he led the Process Engineering group at QLT supporting API and drug product development, as well as commercial manufacturing. He has been responsible for the planning and execution of capital projects for internal GMP manufacturing and the technology transfer of manufacturing processes to contract manufacturing sites. During his career, he has had the opportunity to deploy new automation technology at manufacturing facilities for many companies in the pharmaceutical industry throughout the world. Ross is a registered Professional Engineer in the province of British Columbia, Canada and he has a Chemical Engineering degree from Queen’s University in Kingston, Ontario. Dr. Gromeier is Professor of Neurosurgery and the Preston Robert Tisch Brain Tumor Center at Duke University Medical School. He is pioneering brain tumor immunotherapy with recombinant poliovirus (PVSRIPO). This approach has shown promise in patients with recurrent glioblastoma, producing long-term tumor control/survival with high quality of life. FDA/CBER granted Breakthrough Therapy Designation to PVSRIPO in 2016. Ghada Haddad is currently an Executive Director, leading the Global cGMP and Compliance Auditing Organization at Merck & Company. Prior to that she was the Head of the Global Quality Risk Management Center of Excellence, building a team of experts to develop and implement a robust and sustainable QRM program. She holds a chemistry degree and an MBA with over 22 years of experience, working in the Biotech and Pharmaceutical industries in the areas of Quality Risk Management (QRM), Validation, Quality Systems and Regulatory, including research, management (people and projects), process development, auditing, regulatory agency inspection, change control and validation. Haddad was the chair of the Paradigm Change in Manufacturing (PCMO) initiative: QRM in Packaging and Labeling, QRM for the Design, Qualification, and Operation of Manufacturing Systems task forces, a member of the Manufacturing of Drug Products Task Force, and co-chaired the Aging Facilities Points to Consider. She is also a faculty member for PDA’s Training and Research Institute and a Science Advisory Board member and a member of the PDA Board of Directors. Terrence Hollis received his Bachelor of Science in Physics and Mathematics from East Carolina University in 2006 and has 11 years of process engineering experience in the manufacturing of Sterile Injectables. Having worked in site and global engineering roles, his areas of focus include; moist heat sterilization, gaseous decontamination, UV decontamination, isolator technologies, aseptic processing, terminal sterilization and parametric release. His current role is Process Engineering Manager at Patheon’s sterile injectable facility in Greenville, NC. Gorazd Hribar has a PhD in Biochemistry and Molecular Biology, which he received in 2009 at University of Ljubljana, Slovenia. He joined Sandoz Biopharmaceuticals in 2012 as a scientist in Downstream Process Development and currently he is also project manager of EU funded project entitled ‘’Next-generation biopharmaceutical downstream process’’. Previously he was employed as a researcher at National Institute of Chemistry in Slovenia, where he was also a vice-president of Board of Governors. His current focus is on development of biosimilars and continuous manufacturing. He is also a co-founder of IchorLabs d.o.o., biotech company. Erwin Irdam is a senior principal engineer at Biogen. Prior to joining Biogen in 2009 he was a research investigator at GlaxoSmithKline and before that as an associate Research Fellow at Pfizer. Throughout his career in API process research and development since 1992 to present, he has been involved in all phases of development from early to late stage, product launches, and life cycle management. He was active in the International Symposium for Innovation and Quality (IQ) where he contributed to the Quality by Design working group in publishing Industrial case studies for Drug Substance Control Strategies. He is currently served in Enabling Technology Consortium (ETC) as a member of the Board of Directors as well as a member of Crystallization and Modeling Cloud working groups. He holds a Doctoral degree in Chemical Engineering from the University of Illinois at Chicago. He is currently working in high-profile Biogen projects utilizing process synthesis optimization, crystallization and particle engineering, chemical kinetics, modeling and development of pharmaceutical continuous processing technologies. Maik W. Jornitz, CEO of G-CON Manufacturing Inc., is a technical expert with over 30 years of experience in bioprocesses, especially sterilizing grade filtration and single-use technologies, including regulatory requirements, integrity testing, systems design, and optimization. Jornitz has published 10 books, 15 book chapters and over 100 scientific papers. He is Chair of the PDA Science Advisory Board, task force member of Aging Facility and Post Approval Change Task Forces, as well as working member of BPOG, an advisory board member of the Biotechnology Industry Council, ICAV and multiple science journals. He recently has been recognized as one of the top ten global industry influencers. As a faculty member of multiple training activities, including PDA TRI, he trains members of the industry and regulatory authorities on a frequent basis. He received his M.Eng. in Bioengineering at the University of Applied Sciences in Hamburg, Germany and accomplished the PED program at IMD Business School in Lausanne, Switzerland. After a comprehensive search process, Stephen F. Kingsmore, MD, DSc was appointed as the inaugural President and CEO of the Rady Children’s Institute for Genomic Medicine in September 2015. Previously he was the Dee Lyons/Missouri Endowed Chair in Genomic Medicine at the University of Missouri-Kansas City School of Medicine and Director of the Center for Pediatric Genomic Medicine at Children’s Mercy Hospital, Kansas City. He has been the President and CEO of the National Center for Genome Resources, Santa Fe, New Mexico, Chief Operating Officer of Molecular Staging Inc., Vice President of Research at CuraGen Corporation, founder of GatorGen, and Assistant Professor at the University of Florida’s School of Medicine. Dr. Kingsmore received MB ChB BAO BSc and DSc degrees from the Queen’s University of Belfast. He trained in clinical immunology in Northern Ireland and did residency in internal medicine and fellowship in rheumatology at Duke University Medical Center. He is a fellow of the Royal College of Pathologists. He was a MedScape Physician of the year in 2012, and received the 2013 Scripps Genomic Medicine award and 2013 ILCHUN prize of the Korean Society for Biochemistry and Molecular Biology. TIME magazine ranked his rapid genome diagnosis one of the top 10 medical breakthroughs of 2012. In March of 2015, Dr. Kingsmore surpassed his previous record in genetic sequencing by reducing the process to 26 hours which was recognized in April 2016 by Guinness World Record as the fastest genetic sequencing in the world. Markus Krumme is Head of the Continuous Manufacturing Unit in Novartis’ Technical R&D since June 1st, 2011. During his career at Novartis, Markus Krumme has had the responsibility to conceive and implement the Continuous Manufacturing Technology and first plant on the Basel Campus. He is the industrial Co-Director of the Novartis-MIT Center for Continuous Manufacturing. Prior to joining Novartis, Markus Krumme worked for Lohmann Therapy Systems for 13 years in leading roles in Research and Development in the US and Germany, including Vice President Research and Development. Prior to LTS Markus worked as a lecturer at the University of Tuebingen, Germany, in Pharmaceutical Technology. Markus is a licensed pharmacist in Germany and has a PhD in Pharmaceutical Technology from the Free University Berlin. His professional focus comprises the total integration of process chains across chemical and pharmaceutical operations covering technical, quality and regulatory aspects, with past profound experience in solid dosage forms, oral and transdermal. Mike Long has over two decades of experience leading product, process and validation development efforts on a wide range of pharmaceutical, bio pharm, medical device, and combination products. Mike has also lead Lean/SS efforts as a process owner and as consultant. Dr. Long currently manages the operations of ValSource’s consulting services working on high value, high visibility client projects. Mike is a Master Black Belt who earned a bachelor’s degree from Worcester Polytechnic Institute, a Master’s degree from Tufts University and a Doctorate from Northeastern University. Mike Is currently pursuing an M.S. in Applied Statistics at Penn State. Before his current position as Global Technical Head of the Personalized Cancer Vaccine Project Rainer was the Head of the Clinical Supply Center in Pharma Technical Development Bioprocessing Europe covering Biologics Drug Substance Clinical Manufacturing & Cell Banking. From 2008 to 2012 he was a department head in Cell Culture Process Development. He started at Roche in 2005 as an MSAT manager being responsible for clinical cell culture processes. In addition he worked in numerous global strategic initiatives and led Drug Substance Technical Development project teams. Before joining Roche Rainer worked for the Munich based German biotech company MediGene on research and process development for therapeutic vaccines, gene therapy and oncolytic viruses. Rainer did his PhD thesis in Biochemistry and Cell Biology at the Friedrich-Miescher Laboratory of the Max-Planck Society in Tuebingen, Germany after receiving his Diploma in Biochemistry at the University of Tuebingen, Germany. Susan Neadle is a member of Janssen’s Product Quality Management Leadership Team. In her role she has global leadership responsibility for Johnson & Johnson Pharmaceutical Sector’s Combination Product Center of Excellence. She also has global leadership responsibility there for implementation of Design-to-Value, leading a cross-functional team to embed best practices in the business to assure consistent customer-centric, high quality, efficient product development and lifecycle management. Finally, Susan has end-to-end accountability for development and deployment of proactive quality frameworks and risk management for emerging and legacy platforms and technologies. She is a Design Excellence Black Belt, and over her extensive career, successfully applied that competence while playing integral leadership roles in R&D product and process development of several new medical device and combination products. Susan’s application of Design Excellence and strong technical and people leadership has resulted in a track record of robust and profitable products with stable manufacturing systems. She has received multiple awards recognizing her positive business impacts. Among them, she was the recipient of the Johnson Medal, J&J’s highest honor for innovation excellence. She has numerous patents and publications. Jeff Odum is the Managing Partner, Strategic Manufacturing Concept Group, and a Global Technology Partner at NNE in the US Office located in Durham, North Carolina. He has over twenty-five years of management experience in the design, construction, and commissioning of facilities in the process, biotechnology, and pharmaceutical industries. A recognized expert in biopharmaceutical manufacturing, Mr. Odum has authored over seventy articles and four Industry reference books on subjects related to GMP compliance, process improvement, and the design and construction of biopharmaceutical manufacturing facilities. He is a welcomed speaker at numerous international industry forums and conferences, presenting on topics relating to next generation facility design, bioprocess manufacturing, project management and GMP compliance. Mr. Odum, a Certified Pharmaceutical Industry Professional (CPIP), served as the North American Education Advisor to the International Society of Pharmaceutical Engineering (ISPE), is a member of the ISPE Biotechnology Community of Practice Steering Committee, and a contributing author to numerous industry baseline and reference guides focused on biotechnology manufacturing, process development, project management and commissioning and qualification. He is a member of the PDA and ISPE technical training faculties and is a Teaching Fellow in North Carolina State University’s BTEC graduate program in biomanufacturing and a Guest Instructor for the North Carolina Community College System BioNetwork Program. He has led training efforts in fifteen countries, including training for global regulators from the US FDA, Health Canada, and the Chinese SFDA. Ms. Paulino is Vice President of Singapore Site Operations and oversees all aspects of operations at Amgen’s Next Generation Biomanufacturing site. She is responsible for the start up, licensure, and ongoing commercial operations associated with biologics and synthetics drug substance for key Amgen products using the latest technologies and approaches to drive the future of manufacturing. During her time at Amgen she has held multiple roles in Process Development and Manufacturing including Executive Director Global Process Engineering where she was responsible for the scale up and transfer of pipeline molecules to clinical and commercial scale, Materials Sciences, unit operation platforms, and digital development. Prior to her current role, Ms. Paulino served as the head of Clinical Operations and Development Supply Chain where she was responsible for delivering against the needs of development functions from early to late stage. She oversaw the end to end supply chain for clinical supplies spanning planning, manufacture of drug substance, drug product and final packaged product, and worldwide distribution. Ms. Paulino has been with Amgen since 2002. Ajay Pazhayattil is Associate Director, Global Technical Operations- Process Validation at Apotex Inc., based in Toronto, Canada (CPGP, CKM). He is an Industrial Pharmacist successful in conceiving, implementing and promoting novel technology and innovative methodologies in Technical Operations, Quality Assurance, Regulatory Affairs and Manufacturing Operations segments based on sound scientific principles. His industry experience extends through solid dose, liquids and parenteral dosage forms. In his current role, Ajay has implemented a comprehensive PV Life-cycle Management System supporting ICH Q8 to Q12 and FDA PV guidance requirements for global sites. He holds an M. Pharm in Medicinal Chemistry and is currently working on his Ph.D. He has authored multiple Process Validation journal articles. Darius Pillsbury currently works at Adaptimmune, a T-cell therapy company based in the UK and Philadelphia. Darius is the head of the Quality Lifecycle Management team with focus in Quality Risk Management and the implementation of a lifecycle approach to process validation. He has worked in the biotechnology industry for 20 years in the areas of Process Development, Manufacturing Science, and Quality. Prior to Adaptimmune he worked for the rare disease company, Ultragenyx, and at ImClone Systems and Eli Lilly in the Manufacturing Science and Technology department. Darius is a graduate of Tufts University with a BS in Chemical Engineering. He has been a member of the PDA for many years and was a co-author of Annex 1 to the Process Validation technical report (TR60-2). As an industry-leading architect bridging business and IT, Mal has extensive experience building next generation business models enabled through emerging technologies, with focus on Information Services/Technology business architecture – and on new IT trends including cognitive/AI, digital, cloud computing, social networking, mobile computing, ‘Internet of Things’ and innovation. Throughout his career he has established a consistent record of leading innovative global transformation programs and alliances for complex, multi-billion dollar global organizations, while generating consulting firm revenues in excess of €1.7 billion. In his current position as Vice President, Head of Innovation and Emerging Technology at IQVIA, which he joined in June 2015, to bring new IT thinking; building and leading a new Solution Design Studio; managing the new wave of cognitive and robotic solutions; launching new agile based accelerator methods. Major accomplishments include delivery of over 30 innovation solutions through the studio including the open source code for Apple Research Kit and initial voice recognition solution with Amazon Echo device; research and delivery of big data/cognitive and robotics strategy and accompanying early business value use cases; maturing the company’s architecture capabilities through delivery of a new architecture framework. Kirstin is currently global head of quality operations for the Cell and Gene Therapy Unit, including quality responsibility for the overall supply chain from apheresis sites back to institutions. Kirstin joined Novartis in February, 2015, as part of the Cell and Gene Therapy unit with responsibility for ensuring consistent and phase-appropriate quality standards for viral vectors and viral gene therapy drug products. Prior to joining Novartis, Kirstin was employed by Lonza, AG in the Global Quality organization, with global quality oversight for biologics as well as cell and gene therapy products. Kirstin has had direct responsibility for cell therapy manufacturing and quality for over fifteen years. Lori Richter is a Senior Consultant at ValSource. She holds a Microbiology degree and over 18 years of experience working in the Pharmaceutical industry. Her areas of expertise include Quality Risk Management, Quality Systems, business continuity management, biotechnology manufacturing processes, and business process development. Her most recent role included developing an Integrated Risk Management program focused on strategic risk and business continuity management. Prior to that she held a global team role, developing and deploying a Quality Risk Management (QRM) program across the Roche Pharmaceutical Division, including developing tools, templates, and training materials, and integrating QRM into Quality Systems. She is currently a team member of the Parenteral Drug Association (PDA) Task Force, “Quality Risk Management for the Design, Qualification, and Operation of Manufacturing Systems”, authoring TR 54-5. Dr Romanov is a hematologist by training, received his primary Medical Degree from St Petersburg State Pediatric Medical Academy in Russia, Master of Philosophy from the Dept of Hematology, University of Liverpool in the UK. He is elected Fellow of the Faculty of Pharmaceutical Medicine, Royal College of Physicians in the UK. Dr Romanov serves as an executive medical director in the US Clinical Development and Medical Affairs Department, CAR-T at Novartis Oncology, based in East Hanover, New Jersey. Ute Schleyer, Ph.D. was appointed Project Manager in the Site & Plant Development department of Vetter in 2016. In this position, she is responsible for supporting projects in the field of pharmaceutical technology. Ute joined Vetter in 2007 as Manager of Aspetic Production. She was promoted to the position of Head of Production in 2008 in the area of manufacturing and filling of sterile drug products, which includes various single and dual-chamber filling lines. After receiving her Ph.D. in biology from the Johann Wolfgang von Goethe-Universität Frankfurt, Ute held the position of lab supervisor in the Institute of Biotechnology, based in the Research Center Juelich, one of the large interdisciplinary research institutions in Europe. Thomas is a leader in Amgen’s Operations organization and Plant Manager of Amgen’s Rhode Island facility. Prior to his current role he was head of Drug Product Supply and Drug Substance Supply in Thousand Oaks with responsibilities to provide global clinical supply out of two drug substance plants, a drug product plant, a device assembly and packaging plant and a small molecule API plant. In those plants Thomas and his teams have successfully matured new operations technologies for their successful commercialization and network-wide deployment. His plant teams received twice awards for being the most improved plants. Thomas champions a culture of safety, global teamwork, operational excellence and lean manufacturing in order to generate product and data most efficiently while continuously improving the operation. Throughout his 25 years of industrial bioprocessing experience in Process Development and Manufacturing, Thomas and his various teams have developed over 40 clinical and commercial processes and created knowledge to commercialize some of the most successful bio-therapeutics. Thomas received a PhD from the Institute for Cell Culture Technology, Germany and completed a 2-year postdoc program. Steve Spear’s work has focused on the anomalous ability of a few organizations to bring value to market faster and easier than typical for the counterparts. These standouts enter situations better prepared knowing what to do and how to do it, equipped with the skills and other capabilities to act on that knowledge. That preparation for success reflects that they’ve been learning, discovering, innovating, and inventing with a speed, depth, breadth, and consistency that is the bedrock for persistent success. The principles by which a culture of innovation is developed grew out of research from standouts in the manufacturing space but have since been applied and validated across the broad spectrum of high tech product design and new technology ramp, life sciences, healthcare delivery, social services, and military situations. He has a doctorate from Harvard, masters in mechanical engineering and management from MIT, and a bachelors degree with an economics focus from Princeton. Marsha Steed has over 25 years of experience as a Microbiologist working in the Pharmaceutical, Biotechnology and Medical Device fields. Marsha has a Bachelors in Biology from Western New England University in Springfield, MA. Marsha is a Senior Consultant for ValSource and in this role helps companies implement quality risk management into their quality management systems and validation programs. Marsha specializes in helping companies develop risk based environmental monitoring programs and performing microbial risk assessments She also performs many training courses and webinars for aseptic processing, cleanroom classification and facility start-up. Marsha is active in industry and currently serves on the Parenteral Drug Association (PDA) Science Advisory Board (SAB) and the Education Advisory Board (EAB); serves on the PDA Task Force on Microbial Investigations; serves on the PDA Microbiology Meeting Planning Committee and has been the chair of the PDA Annual Meeting. Marsha is a former notified body ISO auditor. Paul Stey works as a Lead Data Scientist at Brown University's Data Science Practice. He works primarily with biomedical and health data. Prior to joining Brown, he worked as a statistician at the U.S. Environmental Protection Agency. He completed a Ph.D. in Developmental Psychology at the University of Notre Dame. He is broadly interested in ensemble methods for machine learning, as well as high-performance computing. As a Senior Consultant at confinis ag, Mr. Viky Verna currently assists medical device and pharmaceutical companies with regulatory affairs challenges. His qualifications are firstly supported by his education, specifically, a BS and a MS in Biomedical Engineering from the University of Miami, a MS in Pharmacy and a Drug Regulatory Affairs Certificate from the University of Florida, and a Global Regulatory Affairs Certification (RAC) from Regulatory Affairs Professional Society (RAPS). Mr. Verna’s experience with Combination Products started at the US Food and Drug Administration (FDA) as in investigator. Later, at the Center for Devices and Radiological Health (CDRH) of the FDA, Mr. Verna held several positions including (Acting) Branch Chief of the Respiratory, ENT, General Hospital, and Ophthalmic (REGO) devices branch which handles the compliance activities of combination products among others, including drug delivery systems such as syringes. During his time at CDRH, he also served as a: A reviewer in the quality system working group of the Office of Compliance, where he generated and reviewed the regulatory case reports (establishment inspection report review memos) for regulatory decisions; and, A combination product branch lead of the REGO branch. His responsibilities included training and reviewing the work of the team, as well as developing reviewing processes and techniques to be used by the office. After joining confinis, Mr. Verna has helped several companies of all sizes successfully understand, navigate around, and comply with the US regulatory requirements for combination products and medical devices including drug delivery systems. By being an expert member of the ISO technical committee, Mr. Verna has also been leveraging his expertise and experience to help develop international standards for injection and respiratory products, infusion pumps, needles and catheters. Dr. Victor Weigman, Ph.D. is Director, Translational Genomics at Q2 Solutions, a Quintiles Quest Joint Venture, leading the group with a goal of continued facilitation of pre-clinical drug development through biomarker identification. Ongoing research revolves around the genomic profiling of cancer using both DNA and RNA approaches including the development and deployment of robust assays that can be leveraged clinically as laboratory developed tests. Dr. Weigman brings more than 13 years of biomarker discovery research with genomics, with a majority of them dedicated to Expression Analysis (EA), a Q2 Solutions Company. He has published papers on biomarker identification and assay development and has contributed to the development and launch of several genomic CLIA Assays and facilitation of genomics based Companion Diagnostics. Dr. Weigman obtained his Ph.D. at the University of North Carolina in Biology and Bioinformatics within the Lineberger Comprehensive Cancer Center under the supervision of Charles Perou. Dr. Wilson has been with Biogen since 2011 in Pharmaceutical Operations & Technology, responsible for operational performance improvement. Prior to joining Biogen, she worked for Wyeth / Pfizer for 10 years, holding a variety of positions supporting manufacturing operations, including production scheduling, new equipment project management, shutdown management, business process improvement, labor and capacity modeling, operational excellence and technical training. Most recently Dr. Wilson led the team responsible for developing and initiating the implementation of Human Performance risk management practices for all Biogen manufacturing locations. Today, Dr. Wilson leads Biogen’s Human Performance organizational function responsible for global Human Performance risk management integration and investigation of Quality and Safety high risk events. Dr. Weichang Zhou is a well-recognized technical and managerial leader with 25+ years of broad industrial experience and demonstrated accomplishments in biologics (recombinant proteins, monoclonal antibodies and viral vaccines) manufacturing process development, scale-up, characterization, technology transfer, manufacturing and regulatory support. He has been providing scientific excellence and strategic leaderships to many multifunctional CMC teams by serving as senior executive leadership positions as Chief Technology Officer and Senior Vice President, Biologics Development and Manufacturing at WuXi Biologics and WuXi AppTec, Senior Director of Commercial Cell Culture Development at Genzyme, a SANOFI Company, Senior Director of Process Sciences and Engineering at PDL BioPharma and Associate Director of Fermentation and Cell Culture at Merck. Dr. Zhou has published over 50 scientific papers and hold four patents. He has delivered over 100 presentations and lectures in international conferences and professional courses. He has been organizing and chairing conferences and symposia on topics related to development and commercialization of bioprocesses and biologics. He served as one of two chairs for the Cell Culture Engineering (XIV) 2014 conference, Biochemical Engineering (XIII) 2003 conference and 2004 program of the Division of Biochemical Technology, American Chemical Society in the 227th ACS Spring National Meeting. He was elected as a fellow of the American Chemical Society in 2013 and a fellow of the American Institute for Medical and Biological Engineering (AIMBE) in 2002. Dr. Zhou was an executive committee member of the Division of Biochemical Technology (BIOT), American Chemical Society between 2003 and 2014 having served as division’s Program Chair (2004), Awards Chair (2005-2008), Division's Chair-Elect (2008), Chair (2009) and Past-Chair (2010). * Complimentary Conference registration does not qualify for discount offered for Workshop. ** You must be a member to take advantage of this rate. Please note: In order to receive the prevailing registration rate, your registration(s) must be received by PDA by 5:00 p.m. ET on or before the date noted. Please read PDA's confirmation, substitution, refund, and photo release policies for this workshop and course. Please let us know if you have any special dietary requirement we may assist you with. Please contact us at registration@pda.org for help. CONFIRMATION: A letter of confirmation will be sent to you once payment is received. You must have this written confirmation to be considered enrolled in a PDA event. Please allow one week for receipt of confirmation letter. If you have submitted a purchase order or requested an invoice please be advised that a credit card guarantee is needed. Please be advised that if your payment or written cancelation notice is not received by January 18, 2018 your credit card will be charged the prevailing rate. SUBSTITUTIONS: If you are unable to attend, substitutions can be made at any time, including onsite for a fee of $200. If you are a non-member substituting for a member, you will be required to pay the difference non-member fee. If you are pre-registering as a substitute attendee, indicate this on the registration form. REFUNDS: Refund requests must be in writing and faxed to +1 (301) 986-1093. (Emails and phone messages are not accepted). Refunds for Full Conference, Workshops and Events: If your written request in received on or before January 18, 2018, you will receive a full refund minus a $200 processing fee. After that time, no refunds or credit requests will be approved. Onsite registrants are not guaranteed to receive Conference materials until all advanced registered attendees receive them. PDA reserves the right to modify the material or speakers/instructors without notice or to cancel an event. If an event must be canceled, registrants will be notified by PDA in writing as soon as possible and will receive a full refund. PDA will not be responsible for airfare penalties or other costs incurred due to cancelation. For more details, contact PDA at info@pda.org or +1 (301) 656-5900. PLEASE NOTE: Photo ID will be required in order to pick up badge materials on-site. This important security procedure will prevent anyone other than the registrant from picking up their badge and materials. RECORDING/PHOTO RELEASE: By registering for these events, I authorize PDA to record and photograph me and to use the recordings/photographs in all formats and media for any purpose, including for education, marketing and trade purposes. I hereby release PDA from all claims arising out of the use of the recordings/photographs, including without limitation all claims for compensation, libel, invasion of privacy or violation of copyright ownership. Tape recordings are prohibited at all PDA Conferences. Rate: Single/Double: $252.00 - Guestroom rates are subject to State and Local taxes, 6% per room night occupied. Cut Off Date: The cut off date has now passed. Please contact the hotel directly to secure a room based on availability. A block of rooms have been reserved for meeting participants at the Loews Sapphire Falls. The rate is $252 for single or double occupancy. Guestroom rates are subject to State and Local taxes. Reservations must be secured by Friday, February 16, 2018. After this date, reservations can be made on a space-and rate-available basis only. Check-in time is 4:00 p.m.; check-out time is 11:00 a.m.
To make reservations, individuals may click on the reservation link above or call the Loews Sapphire Falls at +1 (866)-360-7395. Please make sure to tell the reservationist that you are with the PDA group attending the 2018 PDA Annual Meeting to receive the PDA group rate. Loews Sapphire Falls is conveniently located near Universal Orlando™. The venue features a beautifully landscaped, resort-style pool with a water slide surrounded by cascading waterfalls, this hotel truly captivates at every turn. From the ruins of the stone turret in the lobby, to the inviting island charm of the 1,000 guest rooms and suites, guests will be surrounded by a vivid, textured haven that is inspired by landmarks of the islands. 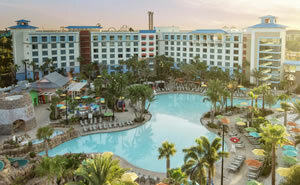 The venue also offers a complimentary water taxi to the Universal CityWalk™area, allowing guest to enjoy a variety of great restaurants and attractions. Additional information on service and amenities offered at Loews Sapphire Falls. Orlando International Airport- (MCO) is located 18 miles (about 20-25 minutes) northeast from Loews Sapphire Falls. Destination MCO has been selected as the preferred vendor for airport transportation for Loews Hotels at Universal Orlando™. Exclusive chauffeured services begin at $115 (tax and gratuity included) for a sedan and can be charged to your geust room. Reservations are required. Visit or call the concierge at +1 (407)-503-5200.
where the shuttle departs for Loews Sapphire Falls Resort every 30 – 40 minutes. Reservations are not required. Pricing is shown below. Mears Transportation also offers a direct service airport shuttle from Loews Sapphire Falls to Orlando International Airport. Travel time is approximately one hour. Reservations are required. Visit or call the concierge at 407.503.5200 at least 24 hours prior to departure. Taxis are on standby at Orlando International Airport, offering service to and from Loews Sapphire Falls for an approximate fare of $55 each way, depending on traffic conditions. Standard taxis can accommodate up to four people. Travel time is approximately 30 minutes. Take the north exit onto the Martin B. Andersen Beachline Expressway (State Road 528) West approximately 11 miles to Interstate 4 (I-4) East. Continue on I-4 East to exit 75A (Universal) and turn left onto Universal Boulevard. Continue on Universal Boulevard to Hollywood Way and turn left. Continue on Hollywood Way and turn left onto Adventure Way. Loews Sapphire Falls is on the left at 6601 Adventure Way. Note: FL-528 is a toll road with one toll of $2.25 between Orlando International Airport and Loews Sapphire Falls. Take exit 259 (Orlando) onto I-4 West. Travel on I-4 West to exit 74B (Universal) and continue on Adventure Way. Loews Sapphire Falls Resort is the first entrance on the right at 6601 Adventure Way. Take exit 75A and continue to Universal Boulevard. Turn left onto Universal Boulevard and travel approximately one-half mile to Hollywood Way. Turn left onto Hollywood Way. Continue on Hollywood Way and turn left onto Adventure Way. Loews Sapphire Falls Resort is on the left at 6601 Adventure Way. Take exit 74B (Universal) and continue on Adventure Way. Loews Sapphire Falls Resort is the first entrance on the right at 6601 Adventure Way. Take exit 205 (State Road 528). Travel on FL-528 to I-4 East. Travel on I-4 East to exit 75A and continue to Universal Boulevard. Turn left onto Universal Boulevard and travel approximately one-half mile to Hollywood Way. Turn left onto Hollywood Way. Continue on Hollywood Way and turn left onto Adventure Way. Loews Sapphire Falls Resort is on the left at 6601 Adventure Way. Self-parking at the Loews Sapphire Falls is $22 overnight or $24 daily. Valet parking is $29 overnight or $34 daily. The Annual Meeting is one of PDA’s Signature Events, and one of our most popular meetings as well, typically attracting more than 600 Conference attendees. With multiple networking breaks, luncheon, and reception, exhibitors have ample time to connect with your desired audience of industry leaders, strengthen business relationships, and create new sales leads. The comprehensive 10’ x 10’ booth package includes one full conference registration and two exhibit only badges, company listing on the Conference website and in the on site exhibit guide, six foot skirted table, chair, trash can, ID sign, on site personal assistance, list of pre-registered attendees distributed at the meeting, and exclusive access to hundreds of highly qualified biopharmaceutical manufacturing, operations, supply chain, engineering, project management, quality, regulatory affairs and laboratory science professionals. Become a sponsor at the conference to strengthen your brand image, increase your visibility, drive traffic to your booth, and align your company with industry leading minds and world class content. High profile sponsorships are available for lanyards, notepads, mobile app, audience response systems, tote bags, hotel keycards, mobile device charging stations, refreshment breaks, lunch and networking reception. We’ll create a customized sponsorship to fit your needs and budget. Closing Reception: A Night in Havana! Wednesday, March 21 | 7:00 p.m. Grab your sundresses and sandals, guayabera shirt and fedora, and celebrate the end of the PDA Annual Meeting - Cuban Style! Join your fellow attendees for a Night in Havana, a Cuban-themed closing reception. Enjoy a night under the stars with live entertainment, specialty cocktails, and Cuban-inspired bites. Want to know more about cleanroom management, container closure, combination products, and other hot topics? Immediately following the 2018 PDA Annual Meeting, PDA Education has you covered with six courses designed to meet your needs. All courses will be held March 22 - 23, 2018 at the Loews Sapphire Falls Resort. This inclusive event is designed to enable participants to discuss the needs and challenges of managing manufacturing-related data. Acquiring an understanding of the development and implementation of big data strategies will also be a key take away! Find out how the holistic use of data and corresponding insights gained can be an effective way to meet many of the challenges surrounding global manufacturing in a regulated bio/pharmaceutical industry.